The stairs at night were really dark. It was bad enough that we had to put lights next to it. However, these lights shined in your face and not the stairs. I wanted to light up the actual steps. I really thought the German video was cool, so I aimed for that animation as my goal. I chose the ATmega328P firstly because it was on the Arduino. It had the hardware SPI, a ShiftPWM library and good enough speed. If I was mass-producing these, I would probably have chosen a microcontroller with less pins. I had some choices when looking for “person detectors”. I could have used laser sensors, IR beam sensors like they use at the store, or the PIR motion detectors. I initially wanted to use the laser sensors because they show absolute presence vs just motion like the PIR sensors, but they were too finicky. The laser sensors had to be positioned just right on the photodiode, and I didn’t know where to buy the IR beams. The PIR motion detectors actually work very well. For output devices, it was clear that I wanted to use the strip LEDs vs the regular point LEDs. I saw some previous implementations like this one and gawked because they didn’t even light up the stairs, only the walls next to the stairs! This person lit up the wall. I laid out a board but never had it printed. It should be completely functional, but have a look before you print it, especially the minimum distance between traces etc. EDIT 2014-10-28: I have finally tested the board and it almost works! This was one of my first PCBs and I messed up in my definition of the 2N7000. As a result, you have to solder in the transistors backwards in version 1.0 of the PCB. In version 1.1 this is fixed. The small rectangle on the left side is a matching through-hole resistor for the photoresistor. I recommend populating the LED headers at the bottom with 2×40 male headers and using black female jumper wires to connect the LEDs. Or you could modify the board to make screw terminals. Added labels for MOSFET source, gate and drain just in case you want to use a different MOSFET. PCB with connectors. I originally wanted to use the red connectors but I didn’t realize they were too thick, so now I recommend the black connectors on the right side. 20x 2N7000 MOSFET or any other pin-compatible MOSFET. SOT-23 packages work well on the PCB too. I recommend buying 2 or 3x everything in the “PCB parts” section in case you decide to start over. Solder half-jumpers to a 2-conductor wire, then solder 2 conductor wire to LED. How do I adjust the number of steps? Only nine of the steps turn on. One of my lights doesn’t turn on/off or it flickers. If it’s just one light then it’s a hardware problem. Try replacing the transistor that controls the flickering light or the light itself. My lights stay on and never turn off. Your transistors may be inserted backwards. Check the pinout on the datasheet. Your transistors might be P-channel instead of N-channel. Check the datasheet. One of my motion detectors does not trigger or has many false positives. If the bottom stairs sensor does not work well, first I suggest swapping the top and bottom sensors to make sure you don’t have a bad sensor. Same behavior after swap means the wire to the bottom sensor needs to be thicker or the bottom of stairs need an environment change to accommodate the sensor, like a reflector on the other side of the step. Different behavior after swap means you have a bad sensor. My choice of female headers as connectors for the LEDs was really bad. The headers are very secure, however all the wires are exposed and it is hard to place one in the middle. Other than that and the point-to-point soldering, I really did not have any problems. Route PCB with FTDI, ISP or Arduino socket on it. 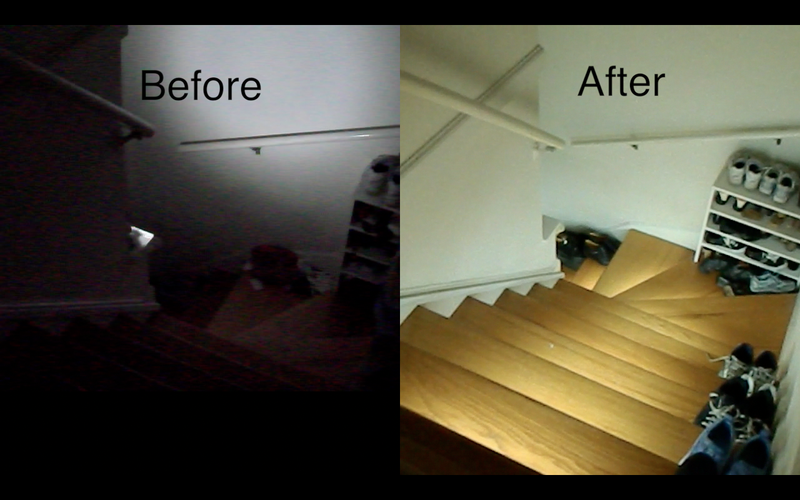 I accomplished the objective of lighting up the stairs as well as adding some extra features like daylight detection. After a long time, I finally completed the documentation and edited together the film I captured so long ago! I feel accomplished. People like you and me have succeeded in banishing the darkness! Publish a video to YouTube, link to it in the comments, and I will showcase it here. Include a link to this page in your video. thanks for designing and programming this awesome unit. The problem lies in that the analog voltage out will range from 3V when an object is only 4″ (10 cm) away and 0.4V when the object is 32″ (80 cm) away. Unfortunately the Arduino has High on its input only when 3v is send to it. Im trying to read the code, and can read some of it, but i have no arduino experience and its and couldn’t quiet get it unfortunately. Could you spare me some thoughts? My stairs lights are working well but there are still issues where sometimes they wont trigger to movement and sometimes they trigger themself. So i’m in search of better triggering system. Yes it is possible. If you know how to wire up the photoresistor such that it produces a high/low for the microcontroller and you run a wire to the other side of the stairs for the laser then it will work. My PIRs work fine if I angle them downward. No false triggers and they trigger every time. Would it be possible for you to contact me through email….? I am getting the Brightness not declared in this scope error. I have read EVERY comment and your answers just to familiarize myself with ALL the issues identified with different experimenters and tried all the suggested remedies for this issue with no luck. From my conjecture, it seems the Arduino IDE is looking for a “brightnessSM.h” file for a library, but I have none in the unzipped collection of files. Is it possible that the “brightnessSM.ino” has to be pasted into the Stairs_Shift.ino and declared as an .ino? Are you using Arduino 1.5.8? brightnessSM.ino should be the second tab open. Thanx for the reply….now I just have to build the board. Stay tuned….I know about as much about Arduino as I do brain surgery, so this may turn out to be a painful experience. P.S. I’m sure it will be worth the pain…your project looks so cool it ain’t funny!! Additionally, it appears looking at the schematics that is can be tweaked to add quite a few other options as well. Just to clarify….the board you have designed appears to accommodate up to 16 steps or channels. Is editing Line#22 to express the exact number of channels desired the only thing that needs to be done to utilize all 16? 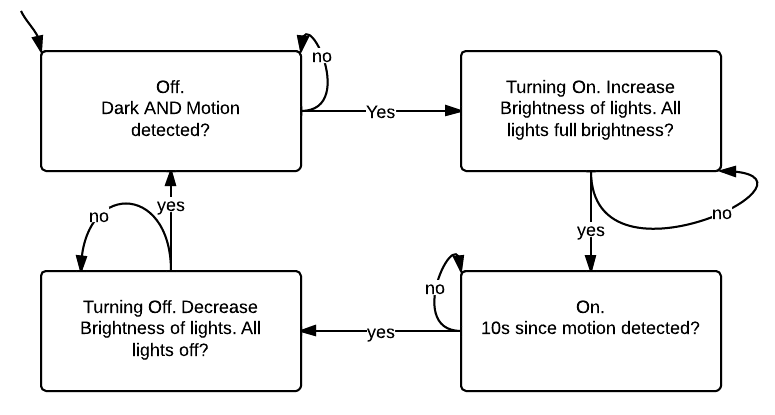 Is it possible to adjust + and – the time between when the first LED comes on/off and the successive ones after that? Looked thru the code and can’t discern where the timing is specified. Yes it’s possible, but not by adjusting one variable. I did not have adjustment in mind when I coded it. I’m working on a new version that allows it to be changed but it’s not ready yet. Mr. Andrew…Would it be possible to update the color image of the circuit board on this web page that illustrates the top and bottom traces in red and blue to Ver: 1.3? When I print the Eagle prints, the silkscreen obscures the traces that include the 7805 and caps that are on the project image site where the newer board file is downloadable. Or define point to point connections where the regulator and caps are incorporated into the existing color image or even a pencil line drawing of the addition to the 1.1 schematic? Sorry to pester…at work stoppage at this point until clarified. Hi Andrew. I designed your PCB board accommodate my needs, but I have one problem though which is 1.3v you mentioned that voltage regulator and cap is mandatory. So I could not find it on your schematics. Can you able to share your 1.3 version schematics? That would be huge help. The 1.3 schematic is the same as all the others. It was only PCB layout problems that were fixed. Actually I see what you mean. 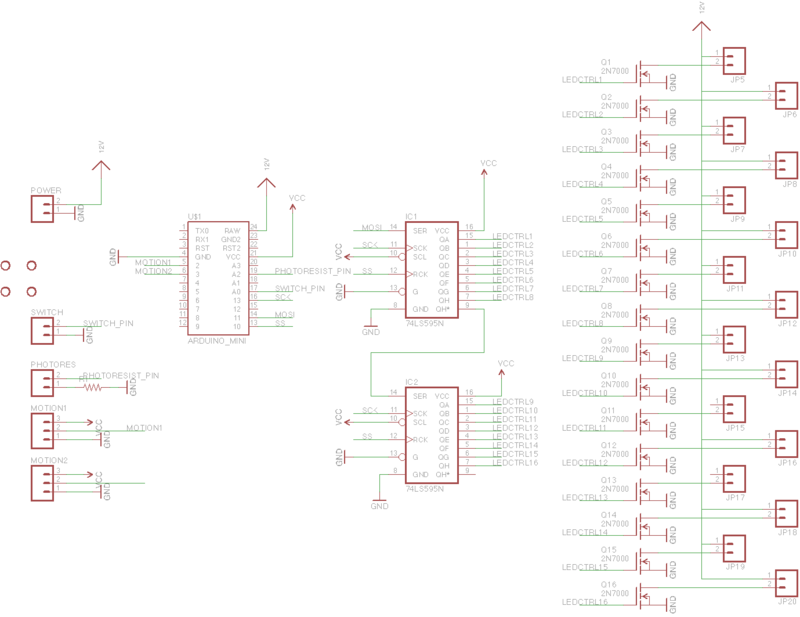 I’ll put up the updated schematic image with the regulator. 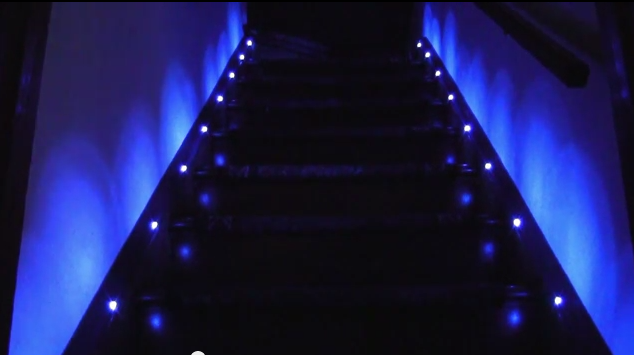 Would you like to make a video with the PCB and your lit stairs to show off? I see. Well, is it worth building the project the way it is currently or will the “new & improved” be coming out soon enough to be worth waiting for instead? And…how did you learn your coding skills? The new version will come out in maybe a month and cost a lot more but it will be targeted toward people who don’t want to solder. I would just make it now and replace the code that adjusts the brightness. You’ll like it more. Well…I must say…it is quite a gift….I am just beginning to dabble in it. Would also like to be able to do PIC programming as well. However, for an old fart like me…the learning curve seem overwhelming. 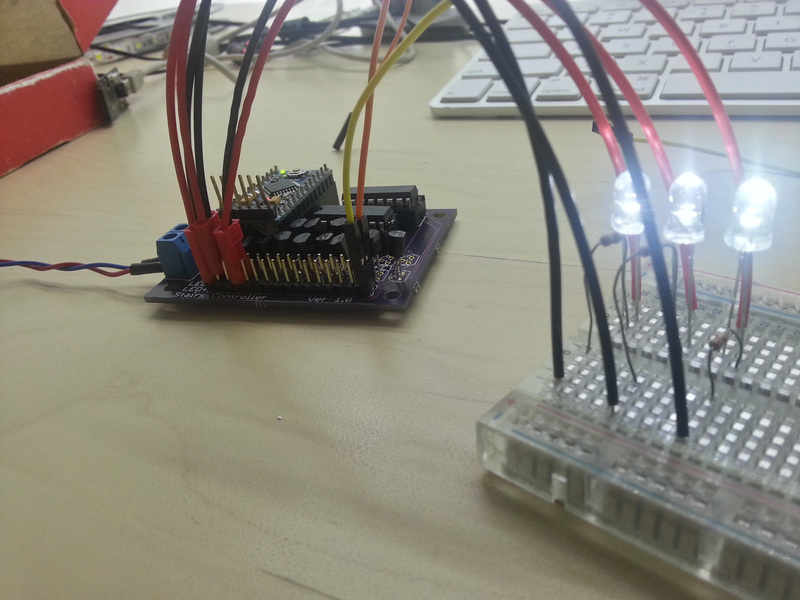 This is a nice and friendly beginner project to introduce you to the world of Arduino. Props for learning at “old fart” age. My parents dont learn anything new anymore. Just curious…what other projects have you published? I’ve looked through all your archives and didn’t see anything on par with this stair light project. Did you check out the Electronic door lock project? It has a video too. To be honest I haven’t published much more because it takes weeks to make a video and I’m not sure what projects people want to see. Any update as to when new “Brightness” Library will be downloadable….? Got most of components together…just waiting on the PIR modules and the Pro minis to have all. It won’t happen any time soon. Try writing it yourself. That’s one purpose of this project. To help you understand basic timing code. Buy a 16MHz 5V Arduino pro mini. I have a newer PCB, v7.0, but it costs about $100 and it is fully assembled instead of the current v1.3 board that you have to buy and assemble yourself. 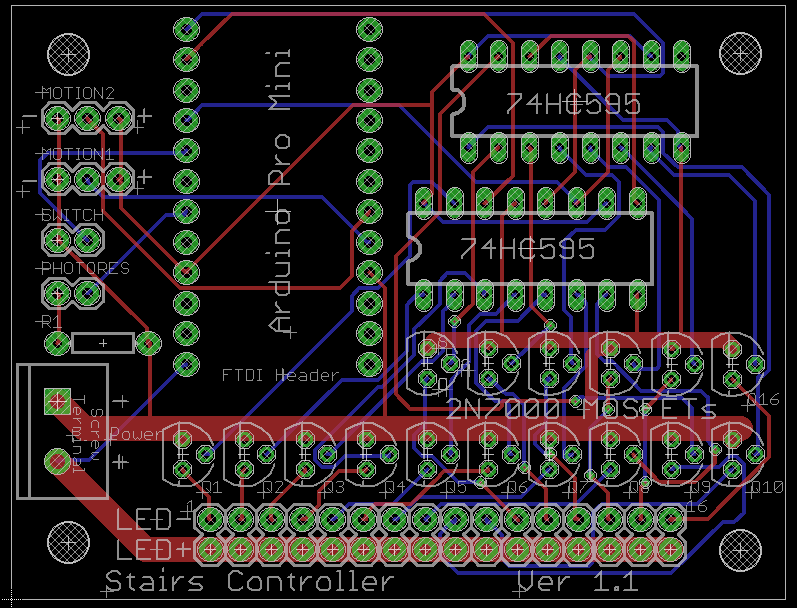 The new PCB has no documentation yet and is not online, and it only works with 16 steps max. If you are interested, I can produce more documentation and ship you one for $100 and you can be an early access user. Or you can just order v1.3, which several people have used at this point. Thanks your feed back but i need 20 steps other wise it not nice with my staircase. Can I modify your PCB with extra 74HC595 Shift register and increase the steps count ? Is it possible? It is possible but you will also need 4 more MOSFETs to go with the shift resisters. See the schematic for how to chain them. It’s not very easy to extend it to 20 steps. You’d have to edit the EAGLE file and fabricate a new PCB with OSH Park. The existing PCB will not work. is it possible to use a Pro Micro atmega 32U4 board instead of pro mini? Hi Andrew, I have tried to load the code to Pro Micro, but I constantly get an error. Even when I try to compile the code with Leonardo (bootloader for micro) I get an error that it is not compatible with this board. I have checked the bootloader on the board and everything is OK. Do you have any idea what could be wrong. Is there some changes that needs to be changed in the code itself? After a year of good lighting of my stairs, the lights are constantly lit. I also changed the arduino the result is the same. You or the community would have a track to solve this dysfunction? If you unplug and plug in the circuit, does it fade on and off? If so then the main circuit still works and there is a peripheral malfunction. It could be the override switch. Did you plug those in? Hi Andrew, sorry for the time of response but my lighting system of my stairs is given to it works alone. I preferred to test a few days before drawing conclusions. yet it did not work for several days before I did tests and I contacted. I do not complain it works 😉 thank you again you were really the person who allowed me to make this staircase !! Thank you !